In 2009, Pat was diagnosed with Stage 3C ovarian cancer. She was a fierce advocate for her own care, keeping up with the latest advancements in research and experimental treatments. Pat was not the type to sit quietly with a book in the waiting area or chemotherapy chair. Instead, she would walk around and say hello to everyone; if they were struggling to pay for their medications, she would get their insurance company on the phone and try to get the problem resolved. Like many women diagnosed with ovarian cancer, Pat’s symptoms were a mystery to doctors for a year-and-a-half before her diagnosis, which came after the cancer had metastasized. Ovarian cancer often causes no symptoms in the beginning. The most common symptoms, such as bloating, pelvic or abdominal pain, and urinary issues, are often symptoms of other noncancerous conditions, making diagnosis difficult. By the time a patient is diagnosed, the cancer has usually spread. In 2010, fueled by her passion for helping others and her drive to empower women to become their own healthcare advocates, she founded the Patricia A. DiNunzio Ovarian Cancer Fund. This 501(c)(3)public charity provides new gynecological cancer patient education, community awareness for the signs and symptoms for ovarian cancer and nursing scholarships. The fund also supports OhioHealth Hospice Kobacker House; Room 25 at Kobacker House is dedicated to Pat in her honor. Shortly after starting the fund, Pat threw herself into fundraising and created the Runway to Awearness Fashion Show. The fashion show blended her zest for fashion with a desire to raise money for the Fund’s mission. 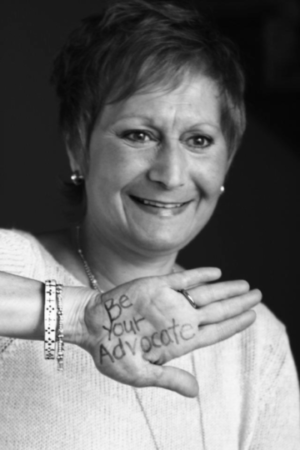 In June 2014, Pat lost her battle to ovarian cancer at the age of 52. Her siblings, Anamarie DiNunzio Rayburn and John Mark DiNunzio, are committed to keeping their sister’s legacy alive. Every year they continue to raise money for the fund through the fashion show. To date, they have raised over $250,000 through “Runway to Awearness” Fashion Show, which includes silent and live auctions. Every 23 minutes, another woman is diagnosed with ovarian cancer in the U.S.
22,000 new cases will be diagnosed each year. 14,000 women will die each year from ovarian cancer. 1 in 75 women will develop ovarian cancer in their lifetime. If the following symptoms occur for more than 2 weeks and if these symptoms are new or unusual for you, see a gynecologist and specifically ask about being assessed for ovarian cancer.